Anyway, on to what Tony should've eaten at that factory. Contains: Vegetables (Sweet potato (20%), Sweetcorn (17%), Pumpkin (unspecified percent)), Water, Ground rice (6%), Brown rice (1%). 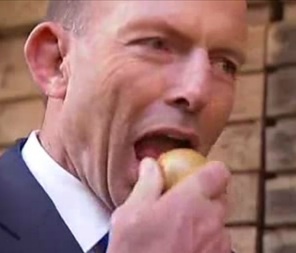 Firstly, NO ONION, see Tony? The inclusion of pumpkin, despite it not being in the puree's name is vaguely interesting, in the same way that there's a drummer in U2, but everybody ignores the fact that he's there and he's probably forgotten his own name. And brown rice... This is verging on a superfood, and Only Organic are the company who trumpeted the presence of 1.6% quinoa in their food... Why not put this on huge front of the jar in large neon letters? Emily's reaction: To be honest Emily had this for tea two nights ago, whilst I was trying to wrangle with a febrile toddler. The fact that there was easily half a small jar left probably means she didn't take too favourably to it though. First impressions: The packaging comes in standard by now Only organic hues, with a picture of a cob of corn, a sliced kumara, and a little serving of white rice in front of a larger bowl containing the puréed mix of the three. No mention of the brown rice, and I won't be drawing any further parallels here. Nor the pumpkin. Again, like Irish purveyors of faux-political activism whilst pertaining massive wealth-mongers U2, there's a staple ingredient within which the music would be bland and soulless without in this, but they'll be damned if it's going on the album cover (please don't @ me with cover art depicting Larry Mullen Jr now, I don't care to take this analogy any further anyway). What I will discuss further, is the presence of a 'Good Night' brand, with a little motif containing a moon and two stars in the upper Right hand corner of the label. What does this mean? Is the food good at night? If you want a pleasant evening, should you eat this? Will it send your baby into a sound sleep leaving the night ahead free for 'adult parent time'? (Spoiler alert: no). The food itself is a congealed yellow mess. 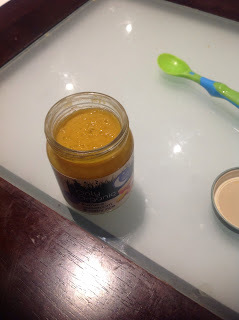 It even LOOKS like canned pumpkin soup. Some weird vegetable cleansing is going on here, and I do not care for it one bit. Bouquet: Straight to the nose wafts strong elements of sweetcorn. Not just sweetcorn, though, sweetcorn and PUMPKIN. I can't detect much in the way of kumara and rice. Rice I can forgive: unless it is Jasmine (hardly likely in a stage one baby purée), rice is hardly the most fragrant of the carbohydrates. Kumara though, as a headlining act in this food, should surely be much less underwhelming? Taste test: first hint past the lips is of sweetcorn, strong, flavoursome, and yes, sweet. Both the pumpkin and kumara hit you next, travelling over the palate towards the back of the tongue, and lingering strongly. The rice does make itself known: whether brown or standard white is unclear, as it is mashed beyond recognition, but certainly it does give the food a slightly intriguing texture on its journey oesophagus-bound. 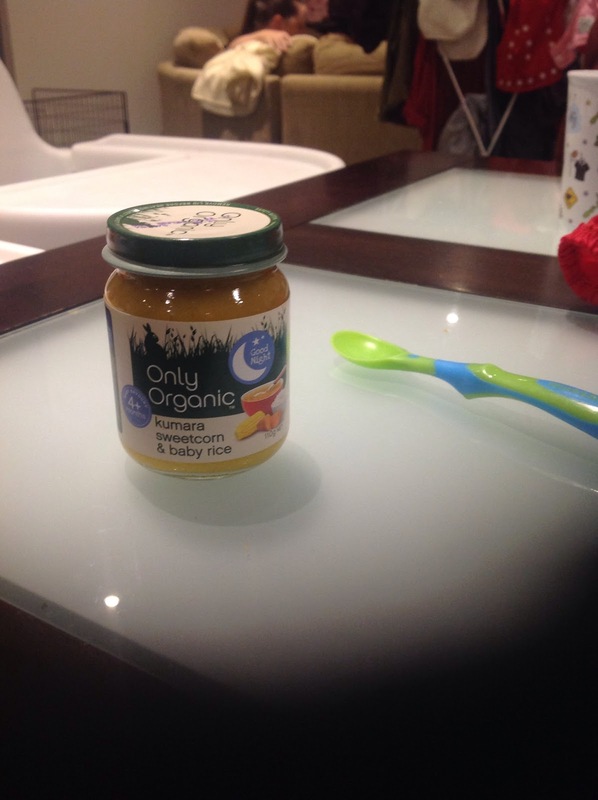 All round, quite pleasant, and I've been quite happily snacking on the rest of the jar over the course of tonight. Overall: 6/10. Not too bad an evening option. Could rebrand as a risotto on the go and sell in a larger quantity. Not sure why Only Organic are so loathe to advertise the pumpkin content though. Enjoy: When a leadership spill threatens to end your Prime Ministerial term in office. With the advertised promise of a Good Night, there'll be no stopping your vote! Best to take a litre bottle of gin, however, just in case you do lose your job.